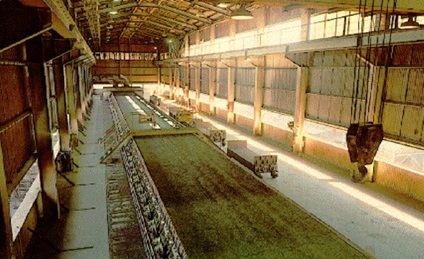 Sintering plants are normally associated with the production of hot metal in blast furnaces in integrated steel pants. The process of sintering is basically a pre-treatment process step during iron making to produce charge material called sinter for the blast furnace from iron ore fines and also from metallurgical wastes (collected dusts, sludge and mill scale etc.). It is basically an agglomeration process achieved through combustion. The product sinter is shown in Fig. 1. It promotes the calcination reaction of the limestone (CaCO3 =CaO + CO2) outside of the blast furnace hence saving heat consumption in the blast furnace. The process of sintering begins with the preparation of the raw materials consisting of iron ore fines, fluxes, in-plant metallurgical waste materials, fuel and return fines of the sinter plant. These materials are mixed in a rotating drum and water is added in order to reach proper agglomeration of the raw materials mix. This agglomeration is in the form of micro-pellets. These micro pallets assist in obtaining optimum permeability during the sintering process. These micro pellets are then conveyed to the sintering machine and charged. A layer of controlled size sinter (bedding) is fed to the bottom of the sinter machine grates for the protection of the grates. After this the moistened micro pellets of the raw materials mix is fed and leveled. After the material is leveled on the sinter machine, the surface of the charged material on the sinter machine is ignited using gas or oil burners. Air is drawn through the moving bed causing the fuel to burn. Sinter machine velocity and gas flow are controlled to ensure that “burn through” (i.e. the point at which the burning fuel layer reaches the base of the strand) occurs just prior to the sinter being discharged. During the machine movement the sintering of the material bed on the grate proceeds downward. Waste gas circuit is to be fully leak proof, not allowing air from atmosphere to be sucked by the system. This results into saving of power in the waste gas circuit. At the end of the machine the sintered material in the form of cake is discharged into the hot sinter crusher. Here the hot sinter cake is crushed to a pre-determined maximum particle size. 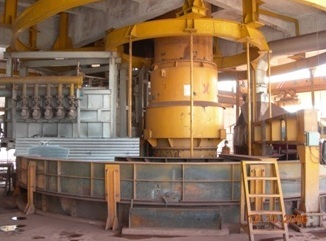 From here the sinter is discharged onto sinter cooler which can be either straight line or circular cooler. After cooler the sinter is transferred to the screening section. In the screening section the product sinter, bedding and return fines are separated. Return fines, not suitable for downstream processing, are conveyed to a bin for recycling in the sintering process. Waste gases are treated for dust removal in a cyclone, electrostatic precipitator, wet scrubber or fabric filter. 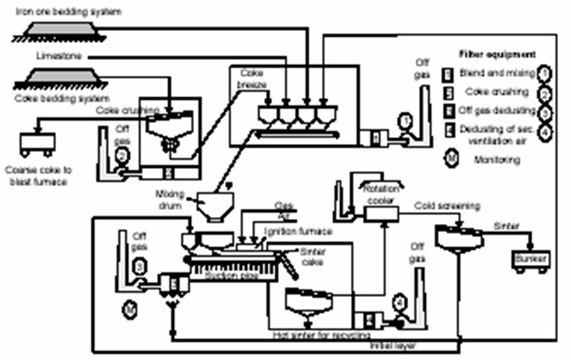 The material flow of the sinter plant is shown in Fig 2. Machines are also being known as Dwight and Lloyd machines. Dwight and Lloyd constructed the first continuous sinter plant in 1906.Circular sinter machines are normally suitable for blast furnaces having useful volumes of 650 Cu m and less. The man parameters of some of the circular machines are given in Table 2. Various features of the circular machines are as below. When compared with the straight line machines the capital investment costs are low and the construction periods are short. Sealing is better and air leakage is less in these machines since the wind boxes move synchronously with grates and since water sealing is adopted. Discharging system makes the size of cold sinter such that there is no need of an additional crusher. Straight line machines are normally used for large sinter plants. Present straight line machines are installed having widths from 2 meters to 5 meters and with effective sintering areas from 200 to 600 Sq m. The productivity of such machines typically ranges from 30 to 46t/Sqm/day. Capacities of such machines range from 190,000 tons per annum to 6.5 Mtpa. A straight machine is shown in Fig 4. Sintering process helps in recycling all the iron, fuel and flux bearing waste materials in the steel plant. Sintering process utilizes by product gases of the steel plant. Knowladgeable artical to understand different type of sinter and their important in BF.